Trapped in this vast expanse of nothingness. Beyond and beyond... past the galaxies, past the end of stardust. Nothingness... Past our universe? No more galactic matter to disperse? Nothingness... the end of all ends? Going beyond what telescopes can see. Our collective pulse quickens. Faint light can be seen! Just a thin ribbon of sublime blue comes into view. The phrase springs eternal. Where big bangs fade into cosmic infinity one after another. The universe that comes now and before. If in techno we trust, deep space dreams can come alive. For our 21st anniversary we will go beyond. 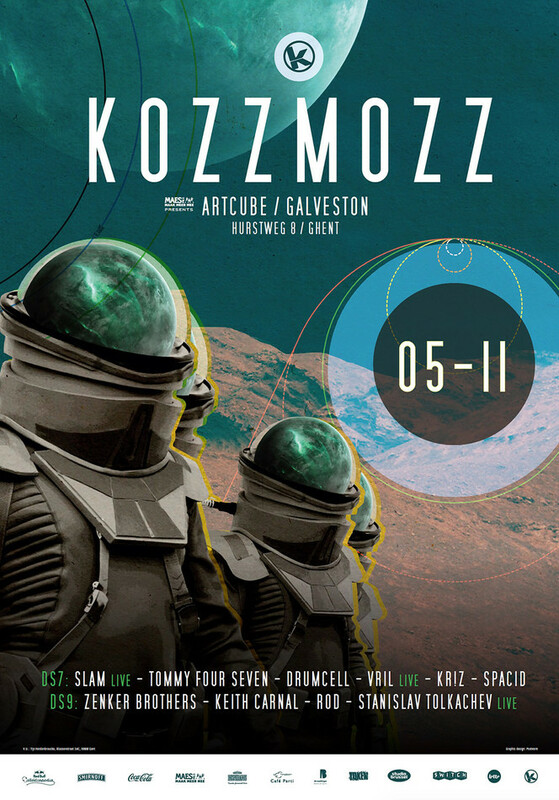 Kozzmozz will be touching down in the ArtCube base with two blinding rooms full of techno luminaries. Bringing the sounds of tomorrow to which we can get lost in a realm of nothingness where the beat of our hearts will sync with the pounding techno music. Our first planet DS7 will be guided to that special place by four international guests of which two will be performing live as well as our trusted residents. As Slam's Soma label prepares to embark on the 25th year of its epic journey, you only have to take one look at its release schedule to understand why they have remained on the cutting edge and firmly at the forefront of musical innovation. Protagonists since the early days and always in the vanguard, forward-thinking techno producers Slam's recent ‘Transmissions: Glasgow’ compilation showed a continued commitment to the future. After presenting some of their finest work to date with their fifth album, 'Reverse Proceed', the legendary producers continue to demonstrate why they are an important part of modern day electronic music, recently with their remix of label mates Clouds' ‘Complete Control’, a veritable bomb, being followed by their enormous 'Make You Move' on their Paragraph track series. So it’s no wonder that 2016 is one of the biggest years yet in the glittering career of this dynamic Glaswegian duo with gigs at all the leading institutions as Berghain, Cocoon, Concrete, Fabric, Sub Club and many more. We’re very happy that they will lead our spaceship on this special voyage, especially as they will be performing live exclusively for us! British born, Berlin-based Tommy Four Seven has established himself as a leading name in today’s techno scene in more recent years, releasing on labels such as CLR, Electric Deluxe and Stroboscopic Artefacts. He also runs his own imprint and event series 47 and is one half of experimental electronic duo, These Hidden Hands. His growing recognition as a remixer has seen him rework tracks from Perc, Truss, Emika, Eomac, Oscar Mulero and Lucy. 47 began as a regular event in Berlin’s Arena nightclub, but saw the series grow and cross international borders to Paris and Amsterdam. Guests are also invited to contribute to the label’s renowned ‘Various Artists’ compilations. A dj. who never fails to bring the crowd to those higher states of consciousness in which there is no room for thought. Seemingly out of nothing, through dust and with no bang, Vril appeared on the scene with releases on Giegling. His music made such beautiful noise that it instantly found his place on Marcel Dettmann’s selection for his ‘Conducted’ CD and on Ostgut’s release schedule. His sound is a search for the evergoing movement, exploring a never stopping energy. Once he catches you in his groove it will shine so bright that you won’t be able to escape it. Tales of his live sets being heard at the Fusion Festival and the Berghain all share the same common feature that it was an as euphoric as energetic travel in sound. His recent release on Delsin records has been acclaimed and played everywhere, while his highly anticipated debut album ‘Torus’ contained some great surprises. Let there be light indeed. Going faster than light speed these days is our resident Kr!z. Recent releases on his revered Token label include Sigha, Oscar Mulero and a re-release of Steve Rachmad’s Scorp alias. In the meantime, Kr!z made his dj-debut in North America with gigs at famous places as Stereo Montreal, Output New York and Technostate LA. The summer also saw him land on many festivals and clubs all over Europe: from Tomorrowland to 4every1 in Madrid, from Nitsa to the Oval Space in London and many in between. Spacid is still on top of the techno game through constant evolution, bringing his sounds to crowds around the country. At Kozzmozz he always delivers. We will go down even further into the abyss of nothingness on Planet DS9, manned by three blindingly fast rising techno talents of the future. ROD is the newborn alter-ego of Rotterdam based Benny Rodrigues to clearly define the more techno oriented side of his musical identity. ROD’s critically acclaimed debut-release ‘Malmok’ was released on Ben Klock’s Klockworks label and formed the start of a fruitful discography that contains very positively received releases on renowned labels such as Chris Liebing’s CLR Recordings, Richie Hawtin’s M_nus Recordings and Adam Beyer's Drumcode Records. Next to these original productions, ROD has also crafted ‘trademark ROD’ reworks for seminal techno-classic such as ‘Slam- Positive Education’ (Soma) and Carl Craig's '69- Poi Et Pas' (Planet E) among others. But above all ROD is known for his deeply rooted dj-sets, which bring him to many techno-hotspots around the world, including Berlin’s iconic Berghain. All this, combined with his highly regarded RODnacht events in Rotterdam, put ROD in the top tier of the new school generation of Techno artists. It was only a question of time when these two artists and brothers would canalise their creativity and start to work together. In 2007 the Zenker Brothers founded the label Ilian Tape with some long lasting friends, in order to establish a platform for their own productions and in 2012 they started playing their notorious B2B sets. Rooted in the legacy of Detroit and Techno, House, Dub, Rap Music and Breakbeats, over the years the two brothers managed to define their own trademark sound with their own productions and their own way of running a label as such building a fundament with patience. Besides focusing on Ilian Tape they have released records on such notable labels as Tresor or Marcel Fengler’s IMF imprint. In 2015 they released their first album called ‘Immersion’, which was the next natural step and heart project. Mind this space because they are hot as meteorite. Final space commander on this voyage into nothingness is Stanislav Tolkachev. He is a techno pioneer from Ukraine. His productions are influenced both by the classic sound of Detroit and the sleek minimalistic tendencies born in Berlin. He is focused on experimentation with textures and psychedelic sounds, taking inspiration from many diverse sources. Tolkachev’s music has been released on many labels, including M_Rec, Semantica, MORD and Geophone. So let’s unite and overcome all in the cosmic void that this new edition of Kozzmozz will create. And we will all create it together!